Only a few additions this week, but what they lack in quantity they more than make up in quality. First is The Hole by Damian Duffy and John Jennings, a graphic novel delivered from Rosarium Publishing, which arrived as part of the Sunspot Jungle Kickstarter reward. Next to it is Lord by João Gilberto Noll, the latest from my subscription to the catalog of Two Lines Press (part of the Center for the Art of Translation). 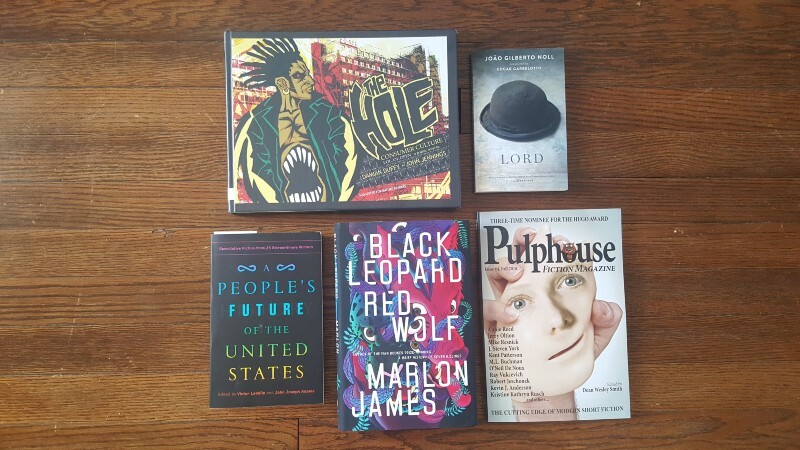 In the bottom row we have A People’s Future of the United States and Marlon James‘ Black Leopard, Red Wolf, followed by the Winter 2018 edition of Pulphouse Fiction Magazine. In reading news, I am about a hundred pages from the end of The Blood-Tainted Winter. I would be done, but I keep getting distracted by, well, book like A People’s Future of the United States. There are just so many good books out there, and so little time for reading.